I spoke with him at the 2012 Toby Hall & Friends Celebrity Golf Classic. He was excited, energetic and anxious to hit the field “officially”. I have to admit, over the last 4 Springs when I have talked to the Tampa Bay Rays CF B J Upton, these phrases never came vividly into my mind. Some will want to discount it immediately as Upton knowing he has to produce, make his name shine above the madness even before the Trade Deadline mark in late July. 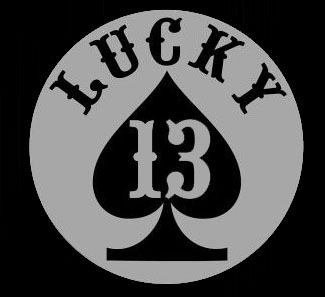 Other dark forces will destined it to Upton possibly entering his “walk” season knowing if he wants a big payday like former Rays LF Carl Crawford, now is the time to put the exclamation points after his name. But with all that diverse and circumventing opinions and comments swirling around like the waters of the Rays Tank, I truly have a hunch that Upton finally feels a part of this team. Over the past 2 seasons his confidence inside the clubhouse has soared, and players now look to him for inspiration and pointers. 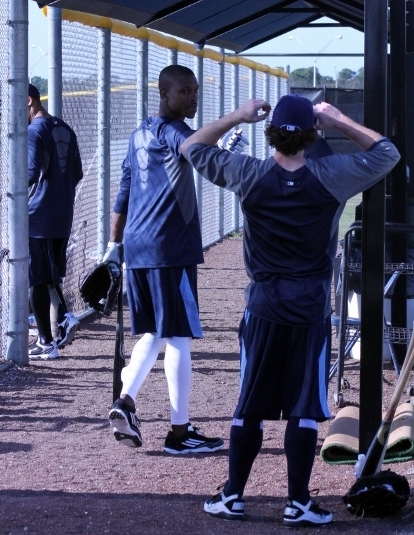 Finally Upton seems to feel that veteran vibe, and it suits him, especially this Spring. 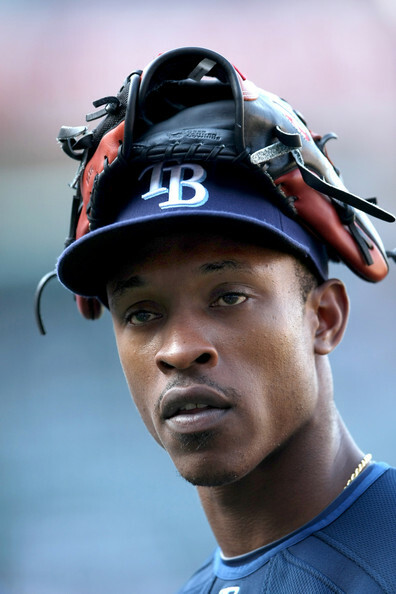 Say what you want on me pounding the drum hard for Upton, but his work ethic in the off-season, and his presence at Charlotte Sports Park even earlier than Pitchers and Catchers Report date shows his agenda firmly has the Rays best interest stamped prominently upon it. This is the Upton I have been waiting for to emerge and want to lead this young squad for a long time. Of course it is only the first Spring contest, and all his pre-Spring rituals and workouts did play into his great start today against the Minnesota Twins on the Grapefruit League’s Opening Day. 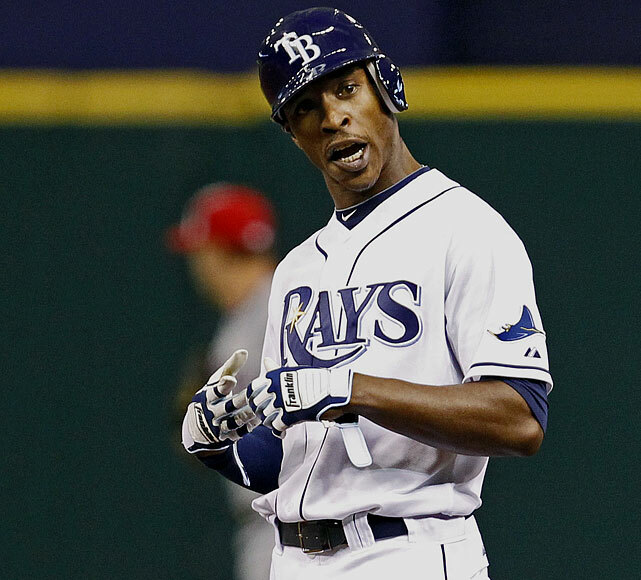 You want to get really excited about Upton’s 2-for-2 day with a run scored, a double and a spirited triple to RCF. 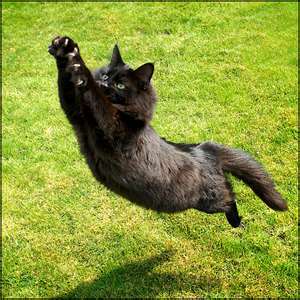 Possibly Upton has found that focus he has swatted away in the past, found terra firma in the Batter’s Box, finally feels confident and ready in his Rays skin. 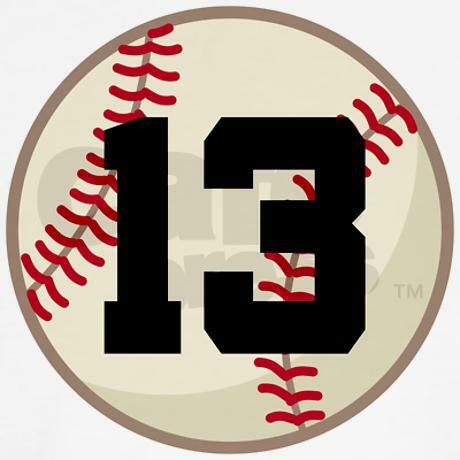 The next 33 days will fly by like the wind, and hopefully Upton can make the Rays Republic confident the 2012 edition of the B J Upton Show will be a “must see” event. 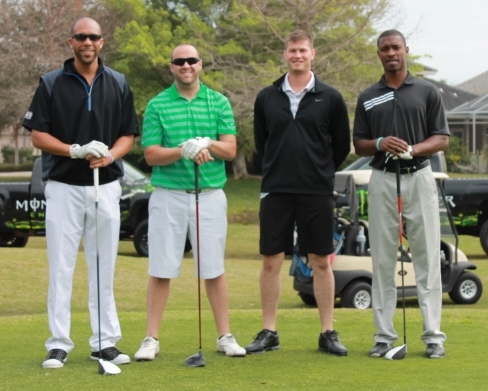 As I talked to him on the 10th tee, Upton was excited that the Rays starting rotation would be all returning, and a few tweaks could make them even stronger for 2012. 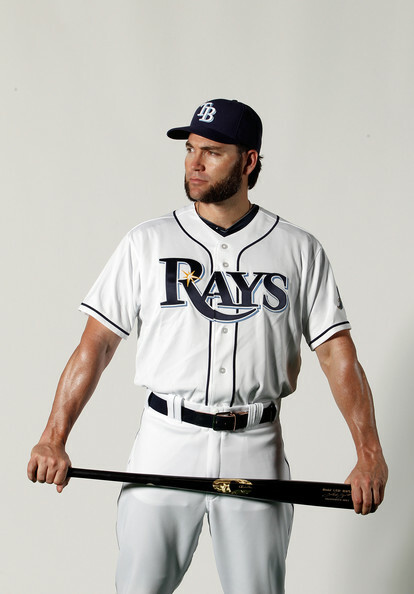 Was anxious to see if the MLB persona of Luke Scott was just an act, or if his psychological warfare and rampant dialogue was just the sort of things to rev the Rays machine somehow reminiscent of the energy and volatile emotions displayed in the past by ex-Rays wild child Jonny Gomes. This is a guy who is harder on himself than any reporter or fan. Who knows his legacy has bruises, tarnished spots and some question his motives and intellect at times. But I truly feel by October we will have seen a different side of Upton at the plate, possibly making a lot of those darkened moments from the past washed off his reputation like the clay from his cleats. 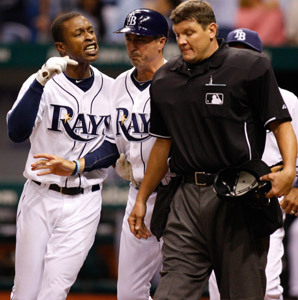 It is about time we get introduced to Upton, the team leader and not just the Rays resident scapegoat. 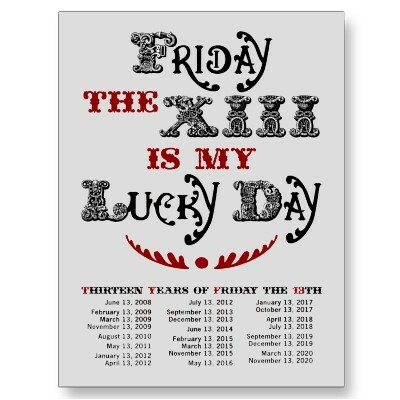 Blogger’s Note: It is that time of year again. Spring Training to also rid myself of the Winter fat and get my brain tuned in for baseball. I will attempt to stretch out my creative process, bring some new items to light and get into seasonal writing shape before the Rays officially open the season against the Evil Empire on April 6, 2012. Going to be rough, there are going to be tired moments, writer’s block and maybe even some moments where the whole process comes up resembling a no-hitter scorecard. 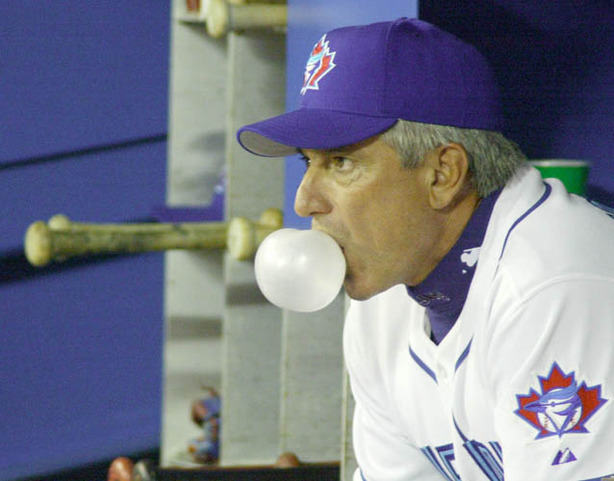 But one thing is for sure, I am excited to again be writing about actual baseball and not hoping for it……Play Ball!!!! 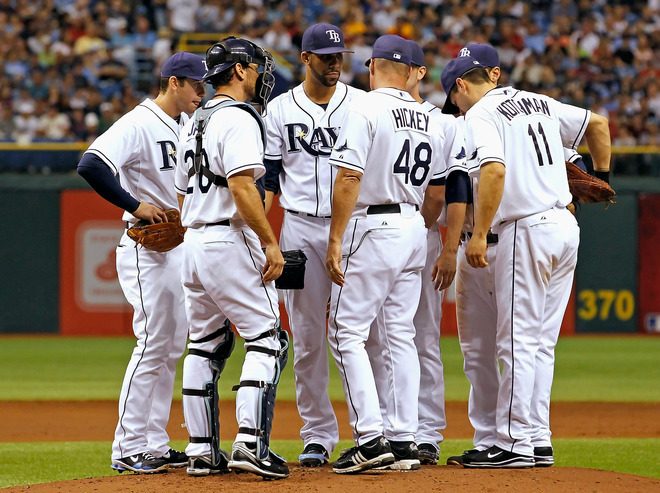 Picking the number 8 Tampa Bay Rays jersey can lead to people throwing high expectations, even lofty comparisons upon your shoulder in a heart beat. For that was the same Rays uniform number that fellow speed demon Carl Crawford took for himself when he embarked on his own rookie campaign with the team. 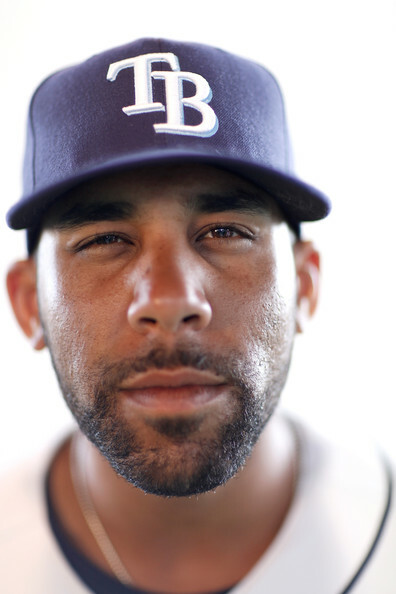 So far in this 36 game spread, I am beginning to forget that other #8 as this one is doing some amazing things to make even the Rays biggest skeptics give a little sheepish grin. Seems like the stars and universe have come and cosmically aligned for Jennings as he was brought up on July 23rd by the Rays almost mirror-imaging Crawford’s own July 20, 2002 call-up. Immediately Jennings got to do something Crawford could never do as a Ray, solidify the lead-off spot and make it productive. 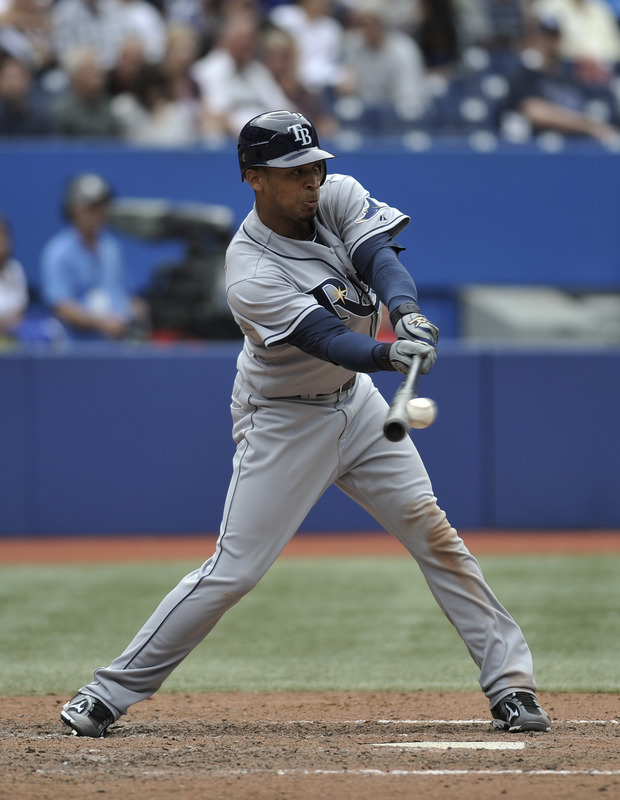 Since his arrival in Tampa Bay, Jennings has produced at such a terrifying rate that he ranks second on the Rays (after MLB leader/teammate Evan Longoria) in round trippers since the All-Star break with 8. 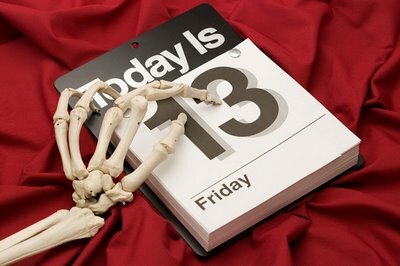 Hmm, there is that mystic number again. 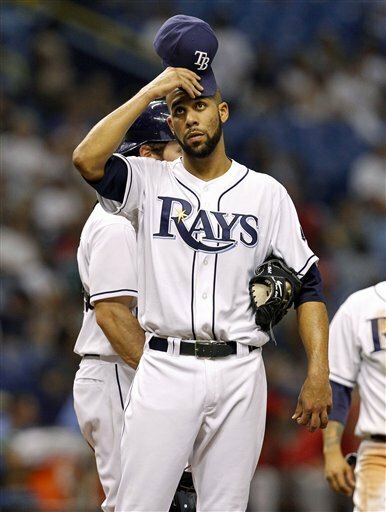 But Jennings haven’t let the stat-heads within the Rays Republic rest as he has a few impressive stats of his own since his July 23rd 2011 debut . Jennings currently leads the majors in stolen bases (14) has 42 hits (19 for extra bases) maintaining ans insane .354 batting average along with a skyrocketing .646 Slugging percentage. Suddenly that old # 8 is beginning to fade from my memory. Need another reason to erase a bit of Crawford from your Rays rookie mindset, in 2002, Crawford appeared in 63 of the Rays final 67 games that season. 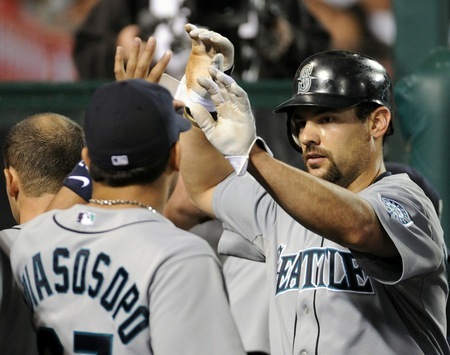 He sported a .259 Batting Average with 2 Home Runs, 30 RBI’s and 9 stolen bases. 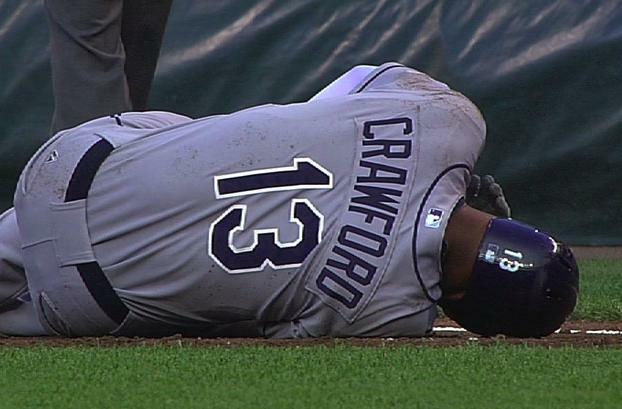 Jennings has already eclisped all of the RBI total already from a fresh and invigorated Crawford’s rookie totals. Wild part is, this kid is just getting started. Someone with a whole lot of time on their hands today (@RaysRepublic) even decided to try and figure out the seasonal numbers of both Crawford and Jennings if each played a 162 game season. Remarkably Jennings would trump even the 2011 edition of Crawford with an estimated 38 Home Runs and 67 Stolen Bases. Crawford would have posted 14 HR and 26 SB. You do not want to anoint Jennings as the “ second coming” of anyone, much less Crawford. But since Jennings arrival in Tampa Bay his elevator has been sprinting towards the penthouse instead of the 8th floor. I kind of hoped this kind of drama would play out where the C C comparisons would be leveled by those skeptics and believers that players like Crawford come once in a lifetime. 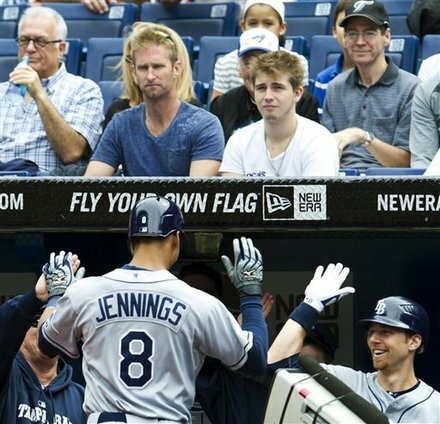 Jennings has done his job so far in making a lot of us in the Rays Republic look past the afterglow of the “C C Era” and dream heavenly thoughts of the future “D J’s Adventure”. Both men left their game totally on the field every night trying to produce, excite and provide something new, thought provoking and jaw dropping. 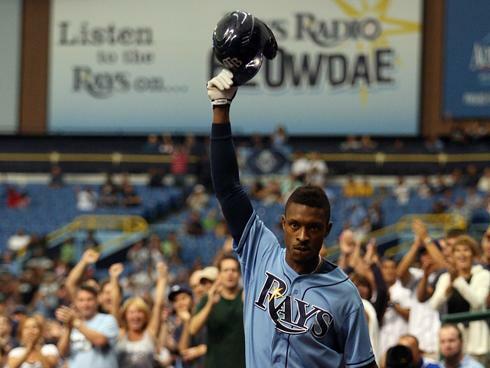 So far Jennings has surpassed so much of C C’s legendary rookie escapades, and we still have over a month left of the Rays 2011 season. 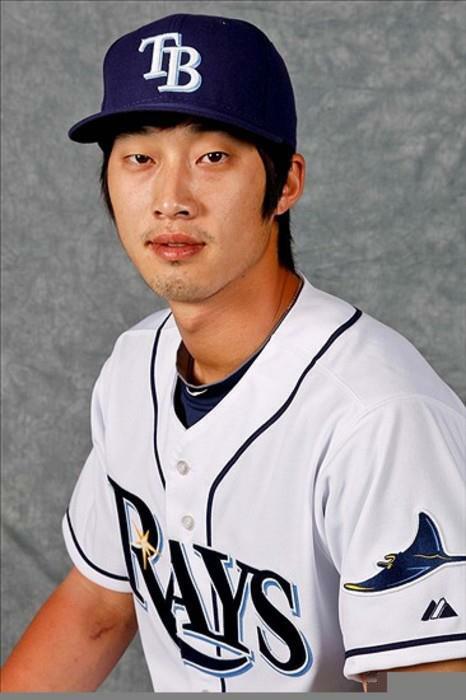 The Rays finally found that 2011 piece of the puzzle they have been searching for and have begun to their wagon to this budding young star on his meteoric rise. I truly can’t wait for Monday night’s Toronto Blue Jays game to see what Desmond has in store for us….I bet it will make a little more of Crawford’s past fade into the darkness. There’s a new #8 in town, and his name is Desmond Jennings. outfield and his rookie Shortstop. harmony with their pitching staff. made any pitcher envious for the 6-3 put out. Alex Gonzalez and Marlin OF Chris Coghlan. 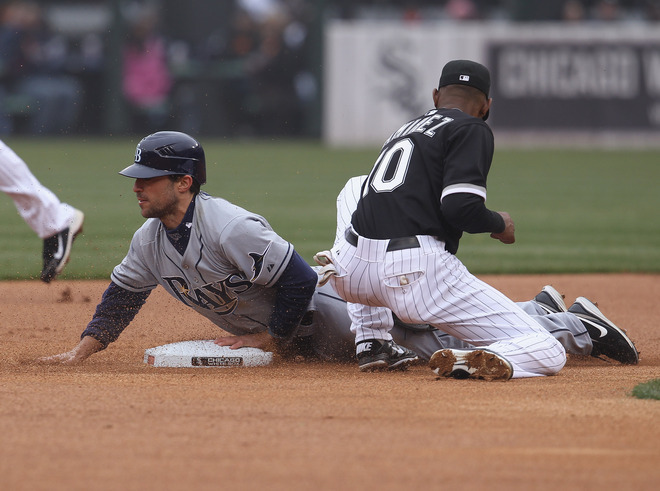 Fielding Percentage ranks second in the American League. 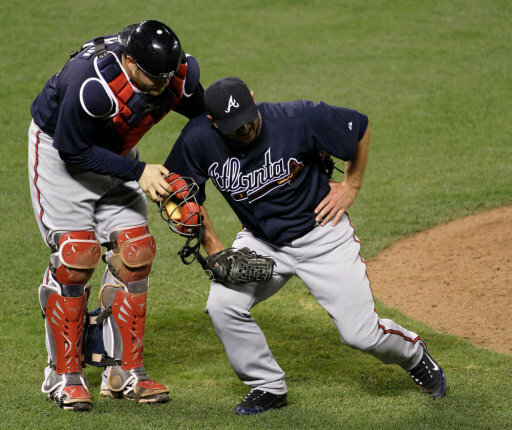 stingy defense, it helps lighten the burden of the pitching staff. or outside hoping for a ground ball and a sure fire out. simply beautiful to the ear. part of his family linage. of the College of Liberal Arts at the University of New Hampshire. now on a mantel with the Rays Republic. amazing when the home team fans stand up and cheer your play. display of man versus gravity. total steals in 98 games over 3 seasons for the Cubs. 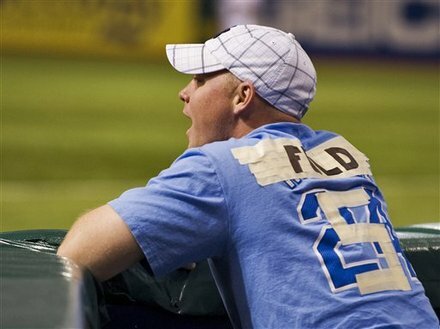 as Fuld currently has 3 BB and 3 K’s to his credit. more than once in 7 of his 301 games. 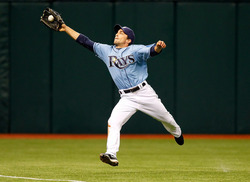 needs tweaking, but his defensive format is perfect for the Rays. the same number 5. Maybe Fuld does understand the numbers……Hmmm? 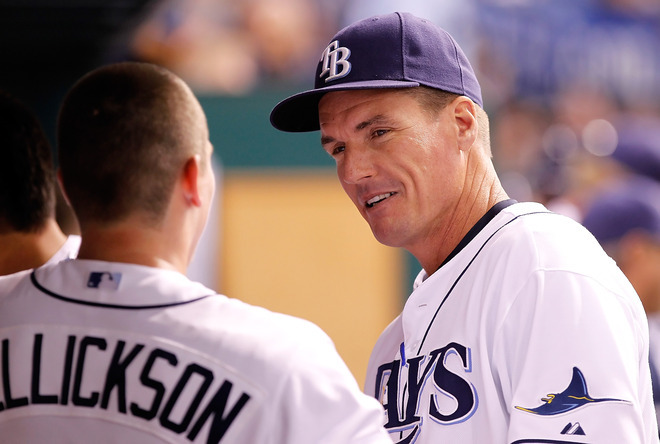 Anyone who has attended a Rays game in the past knows that when Casey Kotchman came into town for a series, there was a line at the Visitor’s dugout. Former teammates, Kotchman Baseball School students, coaches and even friends have been known to surround the dugout rails for a moment with the former Seminole High School star before Rays games. 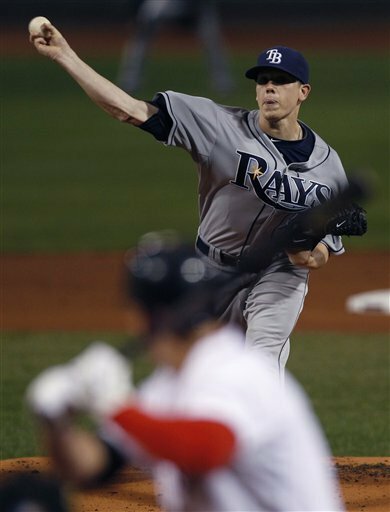 Now the Rays dugout might be feeling that pressure as the Tampa Bay area product is coming home to play for his hometown Rays. The addition of Kotchman today to a $ 750,000 minor league contract with incentives could become another fine tooled feather in the cap of Rays Vice President of Baseball Operations Andrew Friedman as he pieces together another contending ball club. It instantly fills a need for the Rays, plus provides another ounce of proven ability to a club most thought was going to roll over and die for a few seasons. 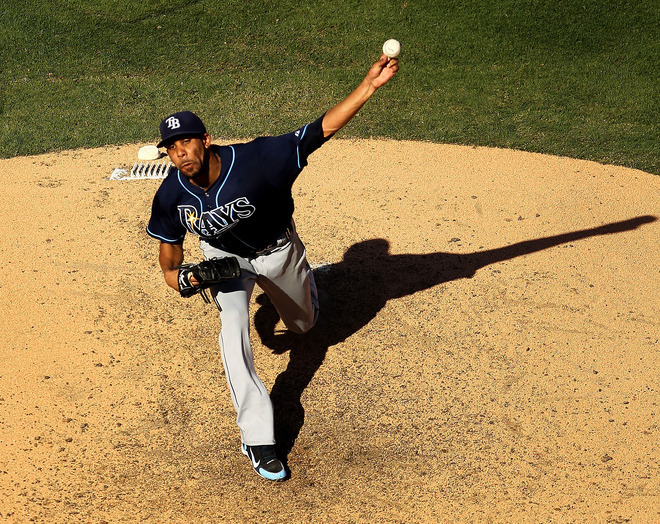 The signing of Kotchman shows the Rays value ability as well as staying within the limits of their thin pocketbook, and might be another off-the-radar pick-up by the frugal Friedman. 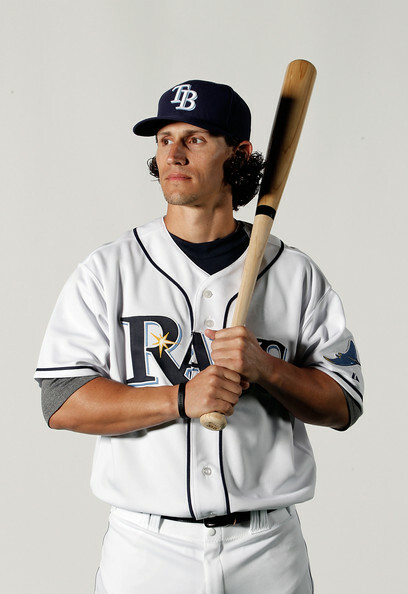 Bringing in local star Kotchman could also have a clear double-edged sword effect on the Rays roster this Spring. In one clear instance, this move will automatically raise the level of corner infield talent and ability at the First Base bag and provide a great measure of not only healthy, but needed competition between Kotchman and Dan Johnson this Spring. 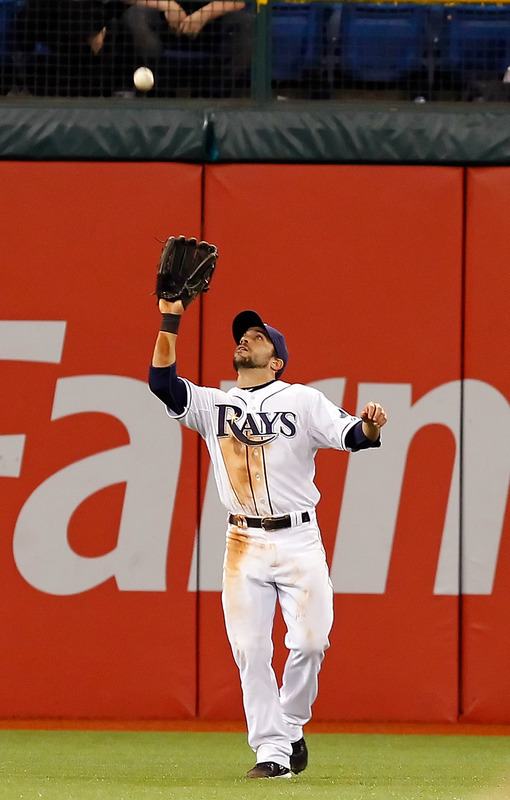 On paper, this signing might look a bit one-sided with Kotchman winning by a landslide the defensive side of the overall 1B equation, but as we already well know, the mind of Rays Manager Joe Maddon doesn’t always follow common baseball logic. 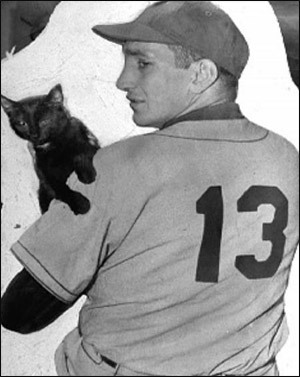 Kotchman has appeared at First Base 581 times in his MLB career with Los Angeles/Anaheim, Atlanta, Boston and Seattle. 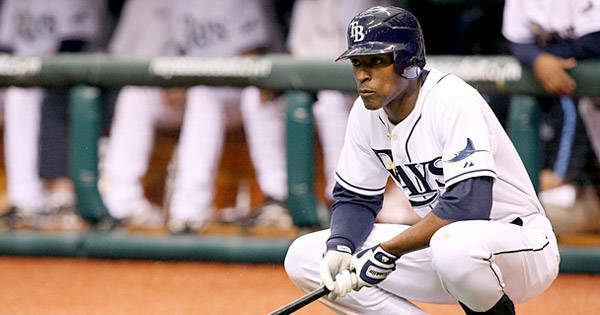 Johnson has only manned the First Base bag only 21 games total in his Rays career. You automatically see Kotchman as a key defensive replacement for departed past Gold Glover Carlos Pena. 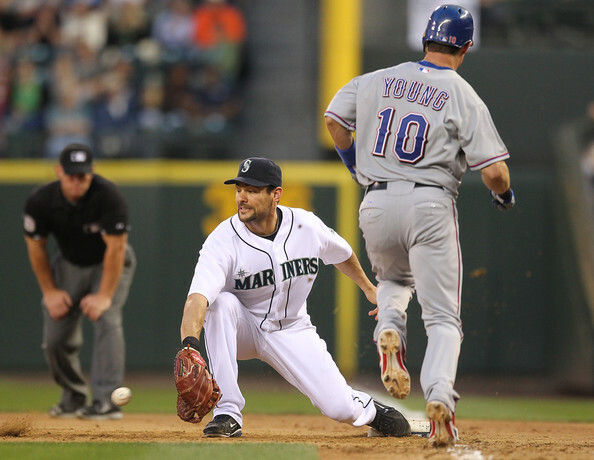 Even though Kotchman, who sports a .998 lifetime fielding percentage including only one error in 116 games for the Seattle Mariners during the 2010 season, it isn’t as clear cut on the offensive side of the numbers. With both Rays First Baseman taking their swings from the left-side of the Batter’s Box ( same as Pena), the ultimate winner of this Spring battle might come down to a few more intricate pieces of either players arsenal such as OPS, RISP. And possibly strikeouts. 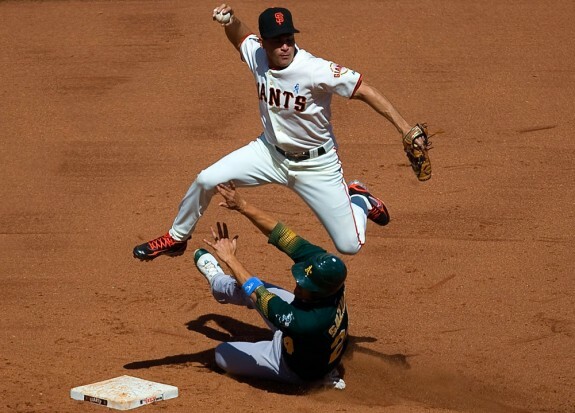 All First Baseman indications prior to the signing of Kotchman seemed to be focused on a Ben Zobrist and Johnson platoon, but the addition of the sure handed glove of Kotchman might actually provide a bit of outfield controversy this Spring. The Rays Brian trust must have a plan in mind prior to this signing, and possibly a platoon action could be configured also with Kotchman and Johnson in mind. Looking at their offensive numbers, Kotchman has not produced as fluidly as he did from 2006-2007 when he was with the Angels. Then again, Kotchman has been kind of pigeon-holed offensively over the past few years in platoon action while with the Mariners, Red Sox and Braves. 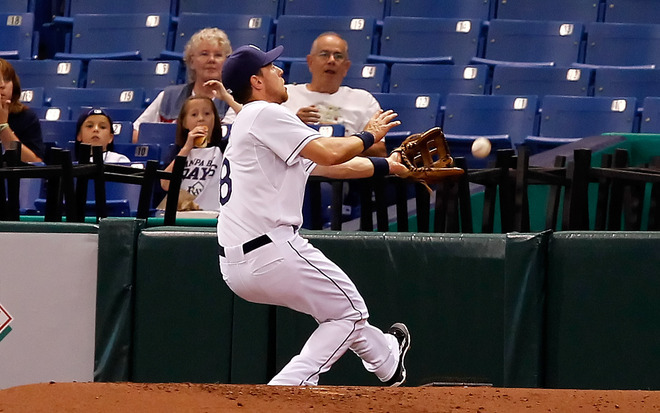 If Kotchman can prove that his .219 average and 75 points fall off his slugging percentage was a fluke, he could see significant starts at First Base for the Rays. Kotchman actually on paper looks a bit like Pena in that when he gets into a solid rhythm at the plate, he can turn on the magic. I still think it is Johnson’s spot to lose. 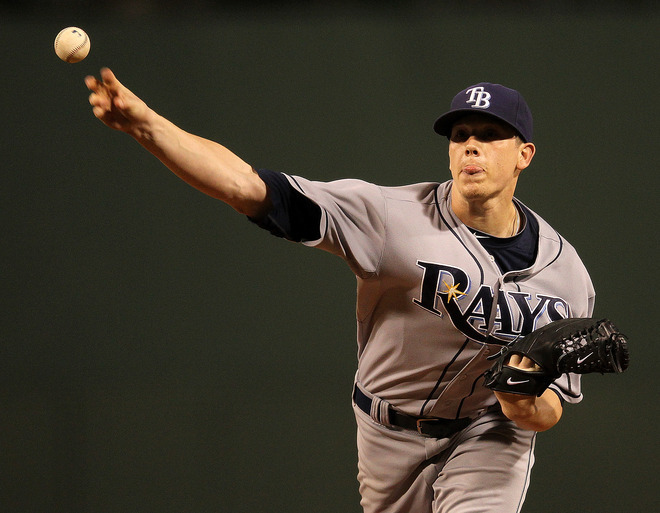 The Rays have kept Johnson close to them for a few years for some reason that defies some of our own logic. 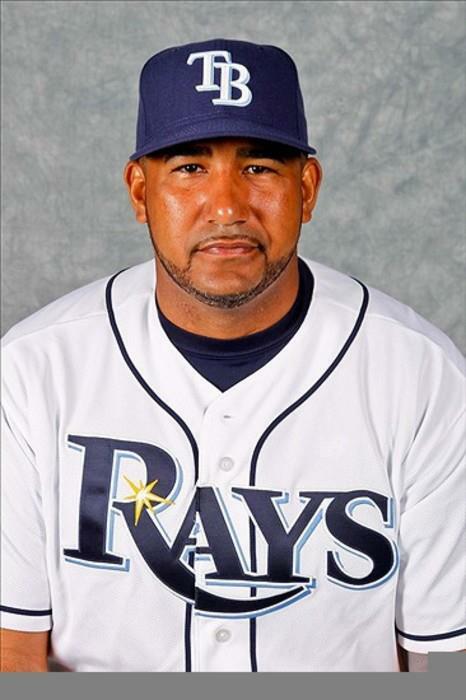 Possibly the Rays have the gut feeling that with extended playing time and at bats, he can return to his pre-2007 offensive numbers he held while a member of the Oakland A’s. Back then, Johnson hit 42 Home Runs in 3 season and produced 162 walks. I want to wax poetic here and think that Johnson’s 2008 Home Run against Red Sox closer Jonathan Papelbon was the greatest HR in Rays history, but some think it was the right guy at the right time only. Personally I would love to see Johnson get an extended 2011 try at first for the Rays, but considering his batting average against right-handed pitchers hovers below .200, but Kotchman only get a slim lead based on his own .239 average against righties. An interesting tidbit is that Kotchman went 1 for 10 (.100) on turf in 2010 while Johnson only went 13 for 63 (.206). But if you look at a factor like On-Base Percentages, Johnson has a slight leg-up on Kotchman .343 to .280. It might just come down to something as simple as run production and game day match-ups to decide who out of this pair might get the nightly starting nod. With runners in scoring position, Kotchman sits closer to .300 against both left-handers and right-handers while Johnson sits under .200 against right-handers. The numbers tend to bunch both of them close into a possible platoon situation with Maddon again possibly tinkering with his line-up nightly to get the slight edge. It might ultimately come down to plate discipline. 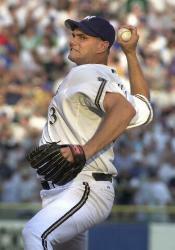 Johnson’s posted a 25-to-27 walk to strikeout ratio while Kotchman leaned more towards the strikeout 35-to-57 in 2010. 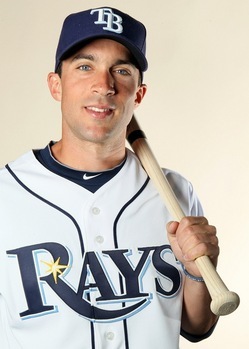 By no means does the signing of Kotchman signal the end of the Johnson idea at First Base for the Rays. It just muddles the waters a bit and provides each player with a dynamic where they have to produce to get a shot at manning the bag full-time. But each player seems even in regards to right-handed pitching, so neither has a solid chance to cement their name on the line-up just based on which side the pitcher lines up on the mound. 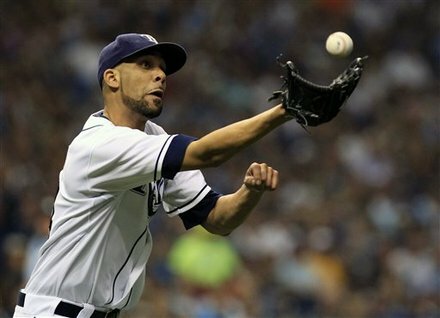 2011 has been a year of surprises so far for the Rays. The addition today of Kotchman has to be viewed as a positive move by the franchise to give the Rays more depth and defensive ability going into Spring Training. 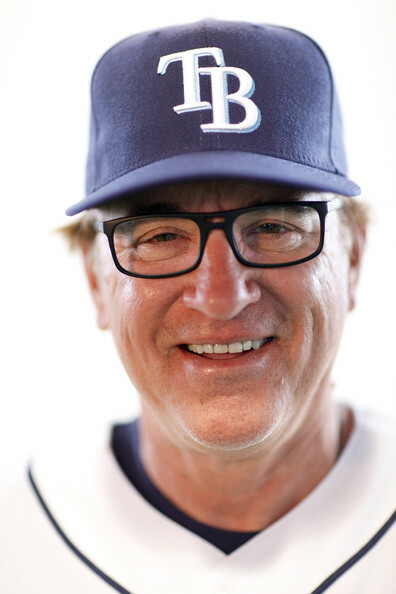 Going into the February 20th report date for all players to the Rays Spring Training Camp, I am going to give a slight edge to Kotchman at First Base. I still think it is Johnson’s to lose, but I got to support and root for the hometown guy…Sorry D J.